Nose: Very bright and acidic. A lot of citrus (lemon) with a malty base. A sweeter note emerges as well. With a lot more time and air the malty note intensifies and there’s now some more fruit of a muskier nature, though it’s a little hard to pick apart–melon? peach? With a lot more time–say, if you were to forget that you still had an ounce or so left in your glass and came back to it 30 minutes later (but who would be so foolish as to do such a thing? )–the fruit gets quite tropical. Palate: Sweet, tart and malty–in that order. Then there’s some peppery-tart mixed fruit juice of some kind and a hit of banana vinegar. Something else vaguely tropical as well–pineapple? The palate gets more malty rather than fruity with a lot of time. Finish: That indistinct fruit and a pepperiness from the wood. Comments: This starts out slow, seems like it’s going to be dull, but then wins you over with the fruity development. It doesn’t become any sort of fruit bomb at any point though, but it goes from being somewhat dull to being a very pleasant summer sipper; and it’s summer now. 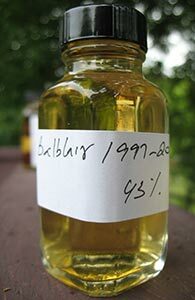 This entry was posted in -Whisky by Rating, 80-84 points, Balblair. Bookmark the permalink. You’ve described in one set of notes all the OB Balblairs I’ve had. The Balblair 1997 is large; it contains multitudes. Yes, the Whitman of Whiskies. Speaking of multitudes, I associate Balblair with Strathisla and with Irish whiskies, they share these notes of squeezed stone fruits/tropical fruits/canned fruits, which are nice but I never found compelling. So more like the Del Monte of Highlands! I gave up on the OBs but I have a cask-strength AD Rattray that I’m curious to crack open at some point. I’m thinking of getting one of the AD Rattray IBs. There is at least a 16yr sherry cask and a 19yr bourbon cask that I’m aware of. Florin, which do you have? I like the stone-fruit / Del Monte notes of Balblair, and the 1989 has a very long finish along with a thick mouthfeel–maybe from being NCF as well as the additional age and sherry. Is that the 1989-2010? I think I have a large’ish sample left of my bottle, which was, if I remember correctly (I’m away from my collection currently), from the 2nd edition. I should give that another whirl–I barely remember it, except that I liked it more than this 1997-2009. Yes. I’ve also sampled the 1991-2009 (18yr), but have never owned a bottle of either. The vintages are confusing. I understand why Balblair is not very exciting to experienced whisky drinkers, but I like their subtle complexity and long-lasting finish. I don’t know that I would pay $130, though, especially at only 43% ABV. That’s why I might be interested in the 16yr or 19yr AD Rattray cask strength bottles. I like anCnoc for the same reasons, which is also owned by the same company. I think the 16yr is outstanding and costs only about $60 near me. But it doesn’t get raves from reviewers either. A lot of whisky drinkers far more experienced than me like this profile above all others; so, I don’t think it’s a matter of experience. I think some of us are more drawn to robust whiskies and others to more delicate ones. As I noted in my review of the Glen Ord 30 some weeks ago, it’s taken me a while to come to appreciate the (relatively) subtler charms of the not over-the-top fruity style of many of the northern Highland malts. I should clarify that I think this 1997 is a very good entry-level malt (and very fairly priced in most of the US). And though I liked the 1989-2010 more, I agree with you that the price is a bit much for what it is–I’d rather have three bottles of the 1997-2009 over one bottle of the 1989-2010. And while I wouldn’t call it outstanding, I liked the An Cnoc 16 the most of all the (few) An Cnocs I’ve tried. It’s just that it’s in Nadurra territory profile-wise and price-wise and I prefer the Nadurra quite a bit and so I always just end up getting another Nadurra. I wish I had saved a sample of that one when I finished the bottle (and one of the 12 yo) a couple of years ago. Further off-topic, but on the anCnoc: I’ll have to compare it to the Nadurra, which I recall as spicier and dryer, probably using European oak. The anCnoc 16yr just has a real thick mouthfeel for me and a long finish, with the bourbon barrel not masking the subtleties of the malt, vanilla, and a touch of brine. Maybe the mouthfeel and long finish are related to the fact that it’s the haziest 46% bottle I own–it’s quite cloudy at not-that-low temperatures. The anCnoc 12yr is a great value, but 40%, chill-filtered, and colored, so not comparable at all–just simple and malty, in my opinion. I’d rather have Cardhu. I see Nadurra is all bourbon casks too, not European. I’ll have to taste it again.